Looking for Cayde-6's current loot locations? Then check out our complete Destiny 2 Cayde-6 treasure chests location guide. 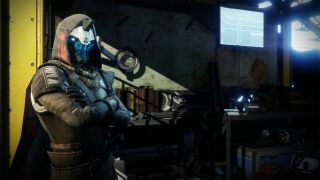 This week in Destiny 2 all Cayde-6's loot chests are located on Io, just make sure you visit Cayde-6 in the the tower to pick up the maps before heading out. Here’s where to find each one. 2. "The lead I got from Asher was some Psion was seen making off with this one somewhere in the Echo Mesa. He mumbled something about it being on top of some Cabal checkpoint, before it - well - fell into a pit of Taken. And we all know how that turns out." 3. "So word is one of the Cabal’s drill engineers found another one of my caches. I don’t know if I did such a good job sealing it or if those dumb rhino fingers are too far to pry it open. Anyway it’s been spotted in some hole near the drill site. I guess Ghaul called them back before they could get into it." 4. "Gotta love the views on Io. I remember watching Jupiter float over the horizon, all big and stormy. I left a cache up there, and….fell asleep. Next thing I know, my Ghost’s reviving me at the base of the cliff. Guess I roll around in my sleep." 5. "Do me a favour and just look into that Pyramidion thing, would you? If the Vex are studying the best of humanity you know they’ve got stuff on me in there."